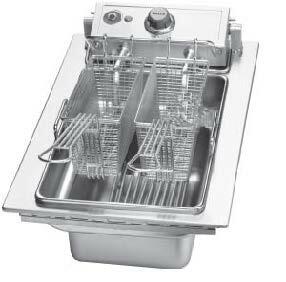 The element is heavy-duty stainless steel with a low watt density for longer oil life. Element control housing has a spring-loaded support rod to secure elements when in raised position. A positive-off thermostat controls the element allowing for adjustable and more consistent temperatures. A signal light indicates when the heating element is energized. A manual reset safety thermostat shuts off the heating element power should an over-temperature condition occur. A red signal light indicates the over-temperature condition. A terminal block is provided for connection to the main power supply. Two half-size (F-556) baskets included with fryer, rear hanging. 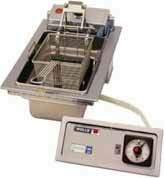 Wells Drop In Fryer models below feature "Auto-Lift"